Finally got some new toys to play with. Three 'application servers' to go over to Curtin University to provide hotspot services to the student residents. There are three models of the Eber - 210, 220 and 230. 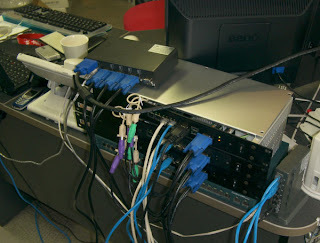 I selected the 220 mainly because it uses Intel network adapters (3 x 10/100 and 1 x 1000/100/10). The 230 would have been nice due to its increased grunt and memory support however I wasn't 100% sure if its 4 x 1000/100/10 Realtek adapters would be supported by Mikrotik RouterOS, not the 2.9 version anyway. Only two small issues with the units. First the screws used to fasten the lid to the unit are easily shredded - they develop some kind of seal against the aluminum lid and combined with the not so hard metal they're made of causes them to be difficult to remove. Although out of 3 units with 5 screws each (top lid) only 4 ended up like this, most were on the one unit. A quick e-mail to Yawarra had this sorted quickly, more screws are coming. Secondly the location of the Compact Flash card slot is annoying. Located on the bottom of the board - so you have to remove the entire board to plug the CF card in. Removing the board isn't particularly easy since you have to undo the VGA and COM port lugs, 4 mounting screws and unplug 10 LEDs and the mainboard power connector. A trap door style arrangement on the bottom of the unit would fix this nicely. 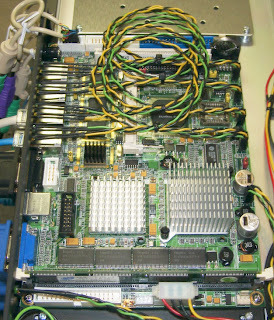 The Commell LE-564 'single board computer' is an (Embedded Board eXpandable) EBX form factor board based on the Via Eden CLE266 chipset. In this case it utilizes a Via Eden-ESP 533MHz CPU. The board is well made and the components all appear to be over-rated items suitable for hostile environments. The board does have provisioning for a directly attached 5v DC power source however Yawarra have opted for a 12V DC-DC power supply with appropriate 12V 4A regulated power pack. I believe this is to accommodate the power demands of a hard disk. I'm a little fearful of the power supply because its quality doesn't seem to match that of the board, and in my experience power supplies are usually the first item to fail. However I'm sure Yawarra have tested the units thoroughly. I flashed a 64MB CF card with the latest stable version of RouterOS (2.9.41) and completed the reasonably tedious task of plugging the CF card in to the board. Because I normally just use the console to install and configure everything I didn't bother plugging in the keyboard/mouse PS/2 sockets or a monitor - straight serial into the com port with 9600 1,8,1,none. Flicked the rocker switch on the front of the unit and watched the console display a typical BIOS POST screen with a memory count in progress (which you can't disable). I tried pressing the delete key to enter the bios configuration with no luck - many interpretations of 'delete' in the console world, so I left it be. Once the POST had completed the usual hardware information screen displayed and that was it... I thought it had crashed or there was something in the bios that caused it to hang while searching for something to boot from (it had automatically detected the CF card as HDD-0). This prompted me to connect a screen, keyboard and mouse. This is when I discovered that it had infact booted and had started the RouterOS installation - it simply wasn't redirecting the screen output to the console as expected. I think this can be fixed by using its "Universal Console Redirection (UCR)" feature? Once I discovered this I just left it do its thing and then reboot itself - once it had booted the typical RouterOS username/password prompt displayed in the console. Pleasantly I found that RouterOS discovered all the necessary hardware and was running fine. The only little oddity that I found is that when making a change to one of the three 10/100 ethernet interfaces it would cause things to pause for about 2/3 seconds before continuing on. The gigabit port didn't display this behavior. I have set it all up as a fully functional hotspot as it will be when installed at Curtin. I haven't yet had a chance to do any bandwidth or system loading tests - I'll be sure to update the blog when I do. However everything has worked out well and no problems like oversized frames/VLAN issues have occurred. Yesterday was pretty much my first day working at Australia Zoo. The whole time was dedicated to introducing us to the operational side of the zoo, what to do, what not to do. It was fairly intense with a lot of information to absorb in one day but it was very useful knowledge none-the-less. The parts I found most interesting were the health and safety, privacy and security aspects. I haven't been exposed to an organisation that was so much within the public eye before. So simple things like "don't point out visiting celebrities" I would never had considered. The staff there seem like a happy crowd that will be good to work with. Plus there's a lot of variety in roles and personalities so there won't be any of that small business monotony to contend with. However, being a reasonably large organisation, it will be my best interest to stay away from any gossip/rumors that tend to breed in such environments. In addition to what I've already done with the hotspot interfaces and whatnot - I am thinking about writing a user installable client application that does everything automatically upon discovery of a supported hotspot. Using the client would also be beneficial for users with particular needs. It could automatically adjust the hotspot to suit a particular application on the users PC. It can provide accessibility options for people with a disability as well because it will basically use whatever they have set in their OS (I guess?). From the outset XUL looks like it will suit my particular requirements neatly. It supports multiple platform with little fuss, it uses the MDC approach and its based upon standard and future proofed languages/formats. I'll fiddle around and see what I can come up with. As promised, more details on the Hotspot interface. This will make it a lot easier to roll your own anyway. Today I gave notice at AccessPlus. I have accepted a position as systems administrator at the Australia Zoo beginning the 5th of April. My primary role will be administrating two web servers located in a datacentre in the US and looking after the local e-mail services. I will also assist in desktop support. Still yet to put detail into my initial plans for the new job but I have some lofty goals in mind for the current environment. I'm hoping my responsibilities will expand into the netadmin side of things, it's only natural for me to pursue my comfort zone no? As a result of this move I have lost my webhosting capability at AccessPlus. Thus I have set up a Google Applications Account and shifted my domain over - so now www/mail/blog/docs/start.naturalnetworks.net all point to one google app or another. I'll be using this as a kind of fancy wiki - documenting my knowledge and publishing articles. Still need a place to store downloads though. Things have come a long way since I started to develop my own hotspot backend. It now has PayPal and Subscriber support. The administration backend was written by another lad but essentially that's just a PHP interface to the database. I few extra scripts such as the PayPal IPN receiver and a subscriber account scrubber cron job runs in the background. The interface supports Mikrotik RouterOS and the Colubris MSC series. 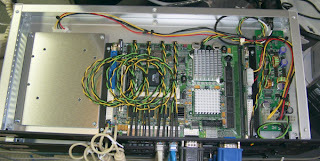 It's not difficult to add different Access Controller types. Once again I will be looking at making the Access Controller stuff modular to make additions easier. At some stage I will write in my own administration interface. Its a fairly large task in its own right when you consider that I have to support multiple locations with their own pricing plans with various pricing items. Throw in all the user management and invoicing/revenue sharing among locations and its a complicated task that requires a fair bit of thought. I'm definitely getting better at coding in Perl at least. I still have a fair bit to learn about more advanced aspects of the language such as Object Oriented Programing (OOP) and package/module writing, probably best to start on the packages/modules first. This has been hanging on my wall for sometime now, thought I'd record it here just in case it gets lost.